Saddle: North of Amfissa, along Hwy. E-65 to Lamia. How to get there: There is a paved road connecting the village Arachova (south) with Amfiklia (north). Arachova is just east of the famous Delphi, home of the Oracle. From Athens, one gets to Arachova by going north to Thiva, then west through Livadia, about two hours by car. Amfiklia is south of Lamia, one can also locate it by going north-west (towards Lamia) from Livadia. Turn right in Amfiklia in order to locate the road that climbs the hillside. This road serves three alpine ski centers, from north to south, Fterolaka, Kellaria, and Gerontovrachos, all by short side roads. One can hike to Liakoura from all three, however I parked at the parking lot of the Kellaria ski center, so a route from there will be described. This parking lot (the upper one) is at location, N38:33.033, E022:34.860, at elevation 1798 meter. Route description: From the parking lot, continue along the zig-zag dirt road that takes you up to the main alpine ski facility, a large building with a glass dominated wall. This place was completely deserted when I was there in September. From here, several ski lifts (5 in 2004) serves the mountain area. 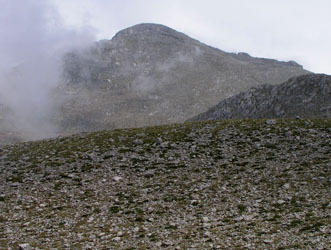 The three to the left all serves the large "hill" (Arnovrisl, 2259m) on your left, while the rightmost lift points in the direction of the distinct Gerontovrachos peak (2389m). Lift number two from the right, heads up towards the saddle between these two mountains. Follow this lift, which is actually two successive lifts to the saddle above. Just beyond the top station, there is a trail that heads into the basin you now face. Ignore the service road that heads right. Just in front, there is a mountain (or large ridge) with two cairns, another trail from your left merges in as your trail turns right in order to bypass this obstacle on the south (right) side. Climb a small hill in order to get to a saddle along this ridge. Once in this saddle, you see Liakoura for the first time across another, somewhat larger basin. The trail descends from the saddle and may connect to the pass south of Liakoura. (I do not know, as I first located this trail near this saddle on my return hike.) An alternative here, is to leave the trail and head straight across the basin towards Liakoura, possibly staying a bit high (right) of the straight line. The terrain is a bit rocky for a short section as the route descends to the main valley that comes up from the north. There is a dirt road coming along this valley from the Fterolaka ski area. As you cross this road, the final climb to the summit is all that remains. The slope is gentle and many alternatives exist. Be aware of possible erosion problems and try to minimize your impact. Near the top you will find red paint marking a trail that most likely comes from the Fterolaka area. The route described here is (YDS) class 2, since it crosses terrain without a trail, however, it is very likely that one can follow a trail all the way, in which case this hike would be (YDS) class 1. Comments: This hike was actually a bit confused as I experienced it. Coming straight from my two big climbs the day before (Mytikas and Kissavos), I did not have much time, (Attending a math. conference reception in the early evening.) but thought this might be an easy target. Without a map of the area and without much breakfast, I started out after looking at an outline of the skilifts and mountains displayed on the building near the parking lot. From this, I got the (wrong) idea that Liakoura should be visible as soon as I hiked up the broad basin. 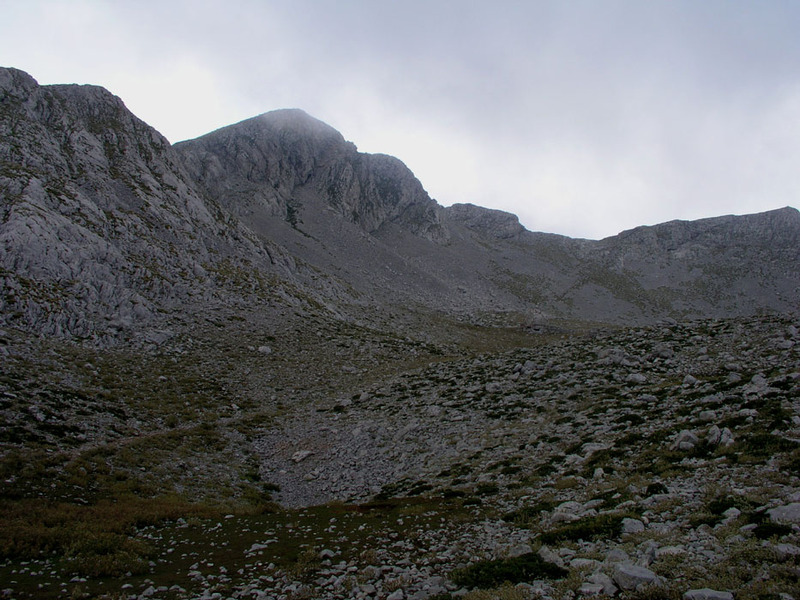 Consequently, I first believed that the "mountain with two cairns" which is just part of a ridge, described above, was Liakoura and consequently climbed it. I soon realized that it was too low, and then located the real Liakoura when I reached the ridge connecting between the two cairns. I then realized that this hike was more substantial than first thought, I was hungry and I felt the hike from yesterday, but the target still looked doable. I descended and made my way across to the peak. On the return hike, I discovered what is the more sensible route described above. I left the car at 1300 and hit the summit at 1500. A 15 minute rest with clouds and fog and quite limited views before heading back to the car, returning in one hour and five minutes. Obviously, my (confused) hike to the peak took longer than what it should if I had followed a more proper route. The entire area looked completely deserted, I did not see a single person during my brief visit to these mountains. The mountain landscape is really nice once you leave the ski area behind, several ridges, steep slopes and many somewhat irregular looking smaller peaks. My Greek trip continued (2 days later) with a climb of Profiti Ilias. 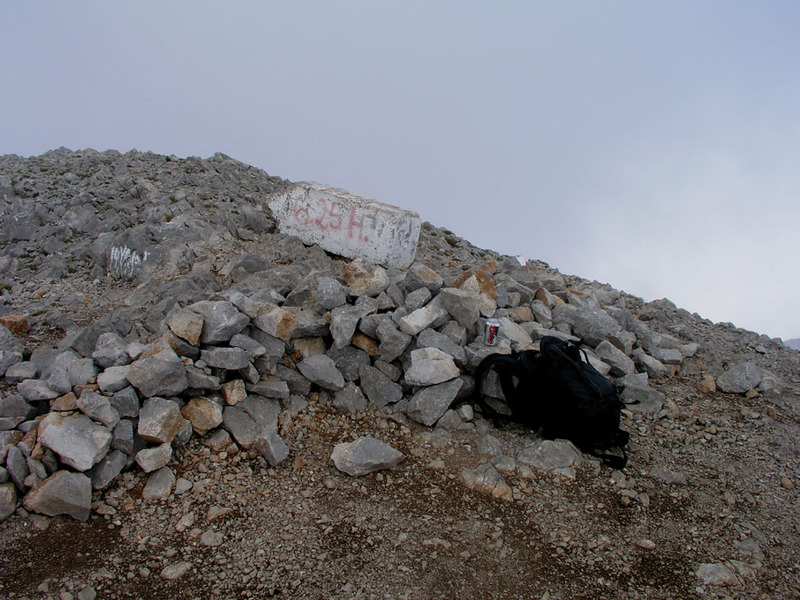 The summit of Liakoura, with a fallen marker. The summit of Liakoura is left in this panorama. The correct trail, goes right and crosses the saddle that can be seen to the right in this picture.